Tuesday was a bee group day and we made arrangements to work at the U Of Alberta textile department. Three of us were able to help them work on some antique quilts. A few years ago the department took a very large quilt collection and now they are wanting to display some of them. To display them they are adding a muslin backed Velcro strip to the top back of the quilts. They are all hand sewn to the back of the quilts. 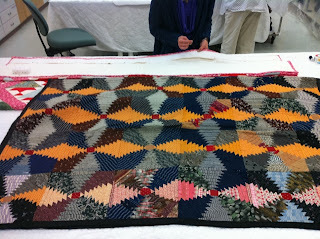 We got to handle the quilts with no gloves (washed our hands lots). This was quilt #3. I got to work on it. 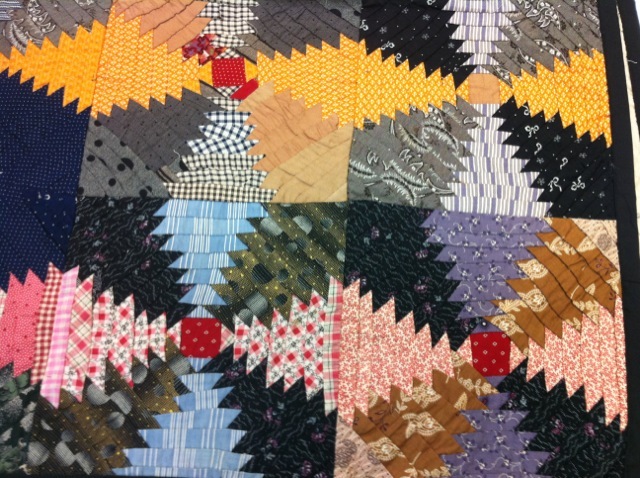 It is a hand pieced log cabin pineapple quilt. It had no batting. It was all hand pieced except the binding ( which I think was added much later to make it looked finished). The last row was a little different also. Like they were running out of the fabric they had in the other rows or was done a few years later. Many of the fabric are men's shirting. Love the Cheddar colour. 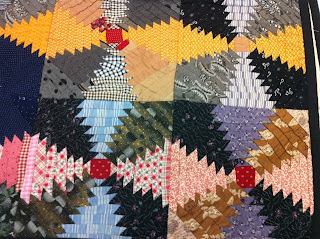 Here is a photo of the back of the log cabin pineapple quilt. You can see the Velcro strip I am added on the bottom of the photo. There were some feed sacks and some very worn out prints used on the back. 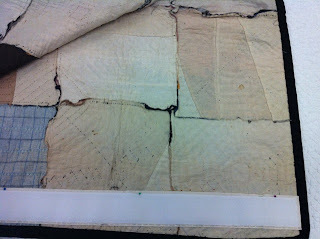 Some still showed the pencil lines the quilter used. 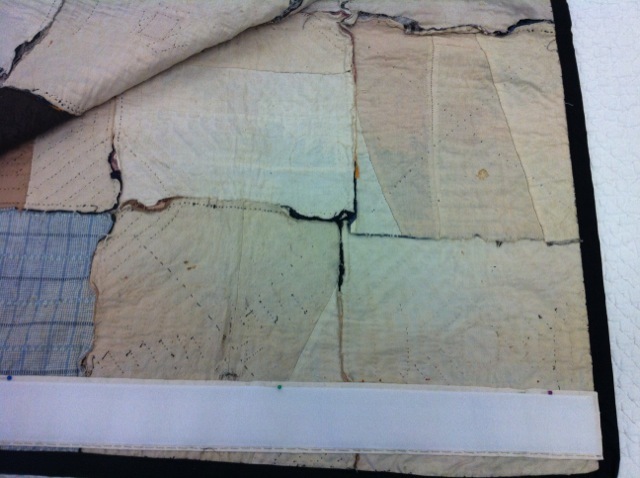 You can see the blocked were pieced together and the seams showing on the back. There were no quilting stitches added, only the piecing was done. I think of this as more of a quilt top, not a finished quilt. Still very old and interesting and shows how it was made. 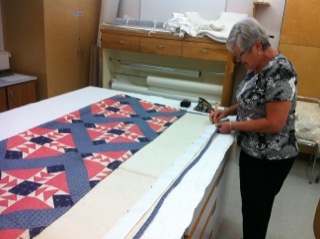 Here is my mom working on a flying geese quilt. We just love that bubble gum pink. Cathy that was a great thing for your bee group to participate in. I am sure that the U of A museum staff really appreciated it. But best of all...you got to be up close and personal with some more of those quilts. 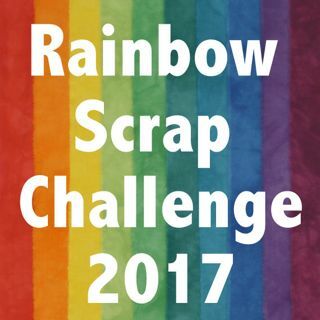 What a terrific project to work on, especially with your Mom!! Now lots of people will be able to view these wonderful pieces at the museum. Glad you gave your time for such a good cause. I have done a little volunteer time at the IQSC on the campus of Nebraska-Lincoln. I vacuumed quilts and got them ready to be stored. It was so much fun to look at all the fabrics--so it was never boring! !